Markets closed on the high on a SELL day yesterday, and the shorting opportunity materialised as mentioned before, right at the open on Dax and also on FTSE today which is SS day. Well this morning it was not that easy to read on the Dax market. Being a SS day expected decline ie. Buy violation as yesterday closed weak, the decline was shallow as the market gapped up and TVGR took effect. and I believe Rich has stated that TVGR takes precedence over Taylor signals. Anyway is was somewhat confusing this morning. Will see how it pans out now, with this huge gap up in the US market. I have today as a Sell day not a SS day. 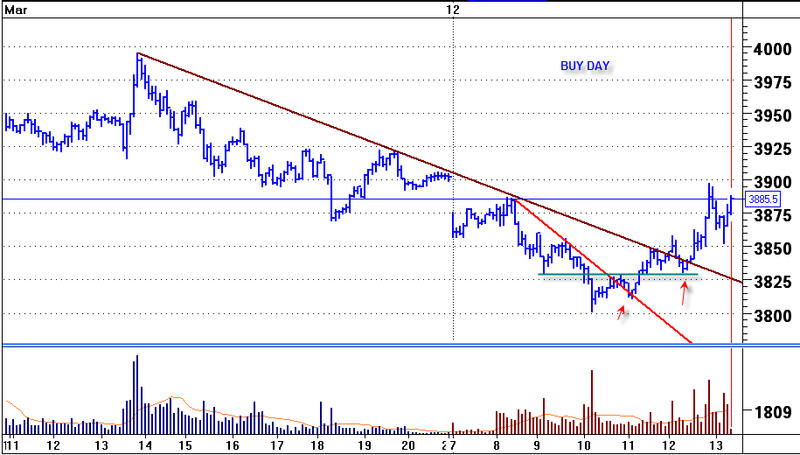 Therefore as such we were to expect a rally from the Buy day low. As we can see on the chart the average rally should have taken the DAX to 3760 which it did right from the open. TVGR was in effect and when the US opened we gapped up there too and TVGR took effect also. We had failed 3 day rallies lately, and that needs to be corrected. One way to do that is to over-extend the rally on a Sell day. Could you explain a little more what you mean by over-extension of sell day rally following failed three day rallies. Following Monday’s BD high being made last I was expecting a penetration of high on Tuesday’s SD. Looked like it came in on the FTSE just after the open, which seemed like an ideal opportunity to short. 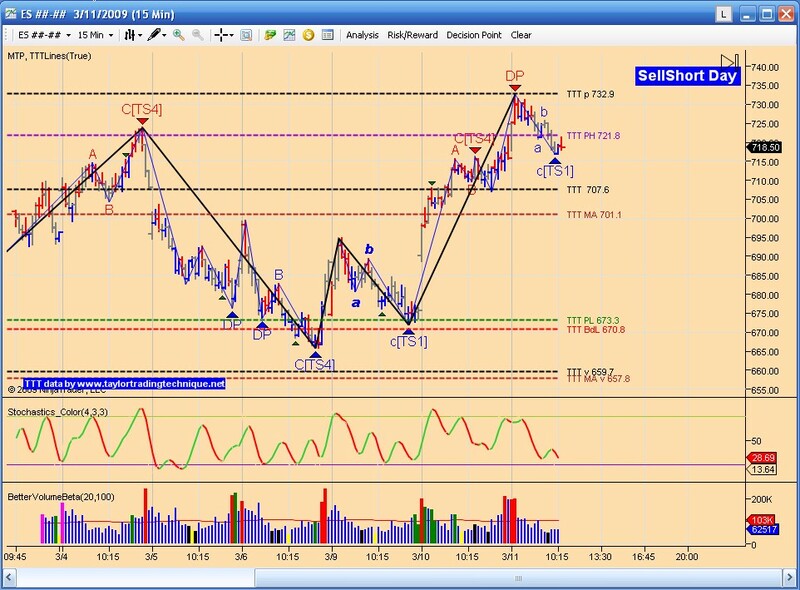 (with tight stop) As Daxtrader pointed out the decline was very shallow on the European markets. 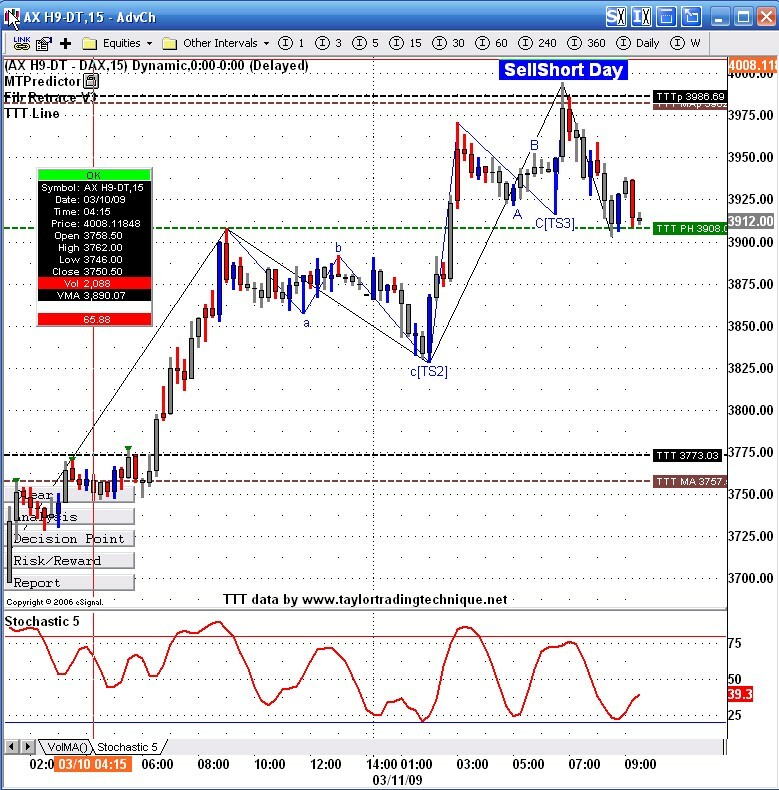 The market then went higher and paused waiting for US open. At that point I was still thinking about shorting as we were close to TTT book projected highs. Market then took off. Should I have ignored usual Taylor rules and given precedence to TVGR. and "In an uptrend we expect penetration of selling objectives and that shorts should be covered after a fast decline"
On the dax there was a rapid 50pt drop before the decline was halted and a rally began. Tape reading clearly indicated taking longs. We will most likely now get another shorting opportunity later in the day. In my experience with TTT and TVGR, I have found that TVGR has a tendency to take precedence to TTT. TVGR will exagerate the moves that were expected or prevent them from happening. What I mean by over extending the rally is that markets at times get exagerated moves. These moves can be in the form larger declines with a failed 3 day rally, or a long rally that continues till the end of the SS day. For example yesterday's rally kept going and going, pausing at TTT levels and then blowing right through all these levels. Today so far looks like we may continue on this rally. Looks like the markets have finally turned bullish (for however long that will last). In bullish markets it is normal to get penetrations of the previous day's high vs. violations in bear markets. As expected shorting opportunities materialised in the afternoon (U.K) both on the Dax which fell by over 80pts and Ftse with a decline of nearly 60pts. On the Dax it was right at the 38.2% retracement(3998) of the decline from Feb Highs to recent low of 3600. We had a similar trade on ES this morning. Right at the TTT numbers and in the DP zone. Everyday does not work out great, today was a buy day, my long bias blocked the gap down on the open on the dax and the TVGR effect thereof, couple of long trades got scratched, guess was too early. 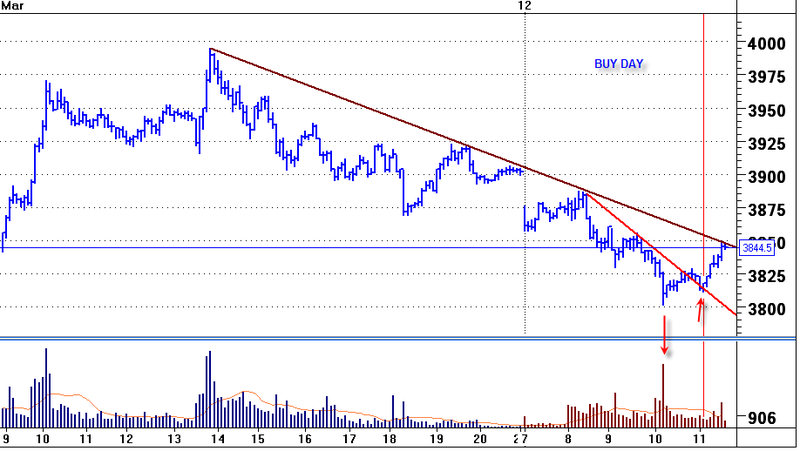 Better trade came along after 10a.m (U.K) once price spiked down on high volume followed by testing on low vol with the break of a downtrend line on 5min charts.